Varieties our experts can’t stop talking about! Sweet, crisp and delicious, China Star is our favorite Chinese/Napa cabbage for the home garden. Its large, oblong heads weigh 3-4 lbs with dark outer leaves, white petioles, and yellow inner leaves. It's excellent shredded into salads or stir-fried with other veggies and meats. Since this cabbage prefers cooler growing conditions, plant in the spring or in the fall in moist, well-drained soil with access to full sunlight. 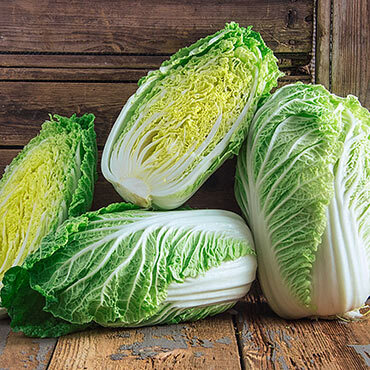 China Star is bolt tolerant, meaning it won't produce premature flowering stems that divert nutrients away from the cabbage, and is resistant to Tip Burn and Black Speck. 70 days to maturity. Zone: 3 - 9 annual. Foliage: 3 - 4 lb. Large headed, Chinese cabbage with dark outer leaves with white petioles and yellow inner leaves. Germination: 7 - 10 days. Days to Maturity: 70 days from sowing. Soil Preference: Moist, well-drained soil. Seed Count: Approximately 100 seeds per packet.